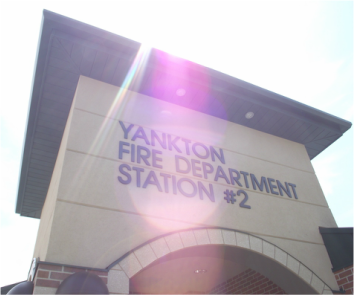 The Yankton Volunteer Fire Department employs two full-time and forty volunteer firefighters who are on call and ready to respond 24 hours a day. Firefighters meet for scheduled trainings on two Monday evenings every month and whenever other opportunities arise. A department business meeting is held on yet another Monday evening every month, proving the time and dedication it takes to be a volunteer. Many of the firefighters have been volunteering for 15 years, 20 years, 25 years and longer. Social events are an important part of who we are. A public open house is held on an evening during National Fire Prevention Week every October. Numerous firefighters visit the public and private schools all during that week to contact hundreds of school children and educate them on the importance of fire safety and prevention. The fire department hosts an annual dinner for the employers of volunteer firefighters who generously let their firefighter employees leave work when the pager calls. Another annual dinner invites retired firefighters to the station to show appreciation for the years of volunteer service they put in before hanging up their fire hats. The volunteer firefighters hold annual fundraisers to raise the revenue necessary to fund the volunteer association, which is not included in any city or rural budgeting. Current fundraisers include selling business advertisements on an annual Yankton Fire Department calendar, along with a donation request mail-out that is sent to all property owners in our service area.